Best one yet: Draymond Green's shirt or a shirtless Nick Young? 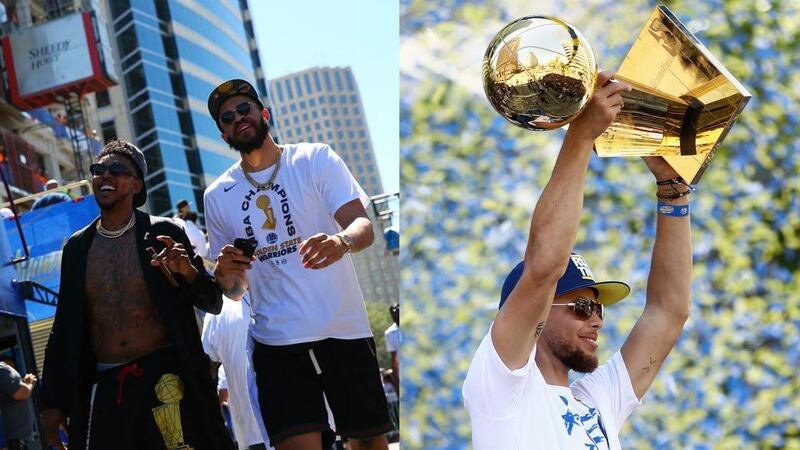 It's safe to say that the weather was nice in downtown Oakland, California, after the Golden State Warriors held their second-straight victory parade for capturing their third Larry O'Brien Trophy in four years. Almost a million Dubs fans—excluding bandwagoners, of course—reportedly filled the streets to revel with the NBA world champions, who went out of their way to mingle with the GSW faithful. Champagne, confetti, and an overall celebratory mood filled the air as the Royal blue and California golden yellow caravan rolled out. While Kevin Durant, Stephen Curry, and Klay Thompson's march of triumph can be summed up with the precious soundbites below, their jubilant teammates and fellow champs had other things in mind. The festivities were so lit that the rest of the Warriors became living memes. Before the Bulls, Spurs, and Warriors, he was a Wildcat. From Shaqtin to hoistin'. Only two less rings than Shaq. Who cares about Rookie of the Year? Dude's a champion. This, despite the Dubs splurging $500,000 on alcohol. Somehow, Double T (as in trash) deserved that. With this, the master troll is officially the king of pettiness. Just admit it: everyone wants to be JR Smith.